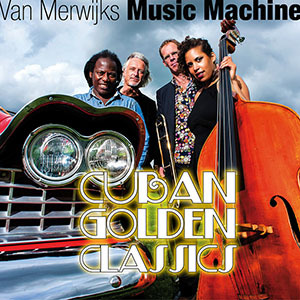 Drummer, percussionist and bandleader Lucas van Merwijk has been showcasing Cuban music for many years, mainly in large ensembles such as Nueva Manteca and his 20-piece Cubop City Big Band. But for this year’s edition of Music Machine, Lucas wanted a more intimate setting and so he invited Cuban piano master Ramón Valle to join him. With Thelonious Monk Award winner Ilja Reijngoud on trombone and new generation talent Adinda Meertins (from Surinam) on bass, Music Machine with Ramón Valle promises to bring a personal and contemporary approach to a rich repertoire of ‘Cuban Golden Classics’. A 1984 graduate of Havana’s Escuela Nacional de Arte, Ramón Valle was introduced by the legendary Chucho Valdes as “the greatest talent among our young pianists”. While still in Cuba, the 49 year-old pianist released two albums (Levitando, 1993 and Piano Solo, 1995), and was a member of Diakara, the band of Nueva Trova founder Silvio Rodríguez. He settled in Europe in 1998 and began recording for Germany’s ACT Records in 2002. Despite his background as a Cuban musician, Ramón doesn’t want to sound 100% typically Cuban, but rather 100% typically Valle. Latin jazz which doesn’t descend into cliché is his aim. It’s most apparent in his solo piano pieces: no sweet playing around with his right hand and no excessive rhythmic trumps. Instead, he shows his Cuban identity between the lines of his musical style. Many Sunfesters will remember Lucas van Merwijk’s previous Victoria Park outings featuring such electrifying guest performers as Ivory Coast bass player/singer/guitarist/percussionist and songwriter Manou Gallo. Other Music Machine alumni include Roberto Vizcaino (Cuba), Theodossi Spassov (Bulgaria), Leonardo Amuedo (Uruguay) and Konkie Halmeyer (Curaçao). Whatever the musical configuration, this Netherlands-based dynamo surely rates as one of the great drummers of our time. “He lays down so much good stuff that even the eyes of a trained drummer can’t catch it all” (jazzprofiles.com).